Events - Oakland Historical Society, Inc.
Edward Dey Page, 2nd Mayor of Oakland in 1906, and owner of The Vygeberg Farm, head-quartered at the Van Allen House and Stream House, is pictured here in front of his home, the Twilinge, which stood on Hiawatha Blvd in the early 1900's. This house was part of his 600+ acre estate where he ran a successful produce and dairy business that helped feed the expanding silk worker population in the Paterson textile district. He was a "Son of the American Revolution", coming from a family that had long supported American workers and their freedom to live full, productive lives. He had the Stream House built as a central office for his business, and a home for the office manager of the thriving dairy farm that his success in America's textile industry had allowed him to create. He employed many farmers as well as professional carpenters, stone masons and other craftsmen who helped create Oakland's first Fire House and many other public and private buildings in town. Plans are now being made for the Northwest Bergen History Coalition 2019 History Day on Saturday, May 4th. Be sure to find out about our 20th century musical theme. We will be looking for temporary displays of your treasured collections. 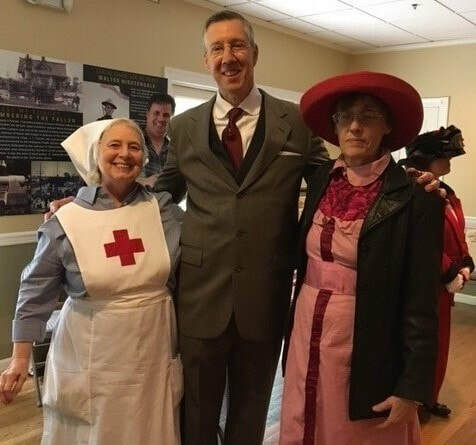 *See the photo below of "President Woodrow Wilson" with suffragist "Harriot Stanton Blatch" and a WWI Red Cross nurse from our 2017 History Day exhibit at the Hermitage in Ho-ho-kus. Members of the Oakland Historical Society got to meet with "President Woodrow Wilson" at the Hermitage May 20th 2017 at our History Day event. The re-enactor shared the president's support for the Red Cross aids during WWI, portrayed by Linda Arns, as well as for the suffragists as represented by "Harriot Stanton Blatch", daughter of Elizabeth Cady Stanton, portrayed by Jerri Angermueller. factory workers in New Jersey and New York become able to improve theirs. She was responsible for bringing female speakers from England over to the US to support the Women's Land Army. Women wanted to help feed the troops and found much resistance from the government in carrying out this much needed service during WWI. The advances made in Bergen County were presented at the event.